A ZF transmission is the best thing next to your engine. 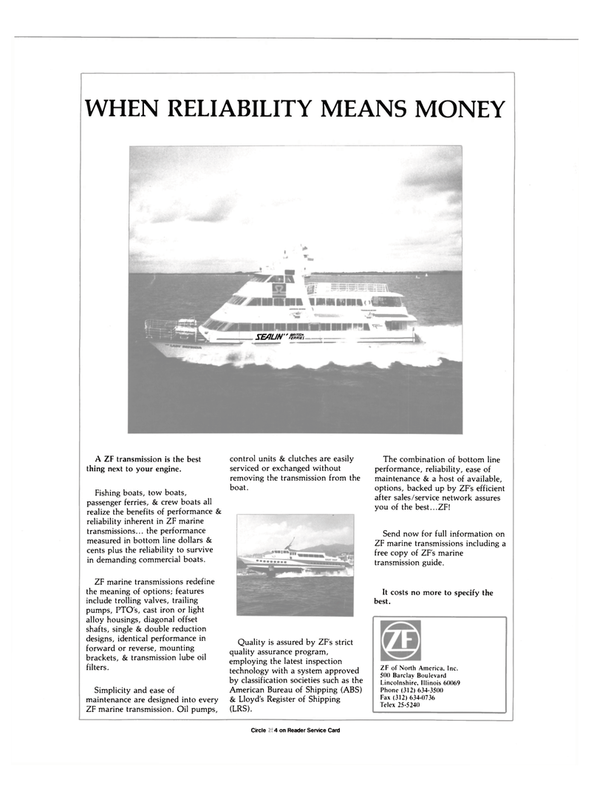 Fishing boats, tow boats, passenger ferries, & crew boats all realize the benefits of performance & reliability inherent in ZF marine transmissions... the performance measured in bottom line dollars & cents plus the reliability to survive in demanding commercial boats. ZF marine transmissions redefine the meaning of options; features include trolling valves, trailing pumps, PTO's, cast iron or light alloy housings, diagonal offset shafts, single & double reduction designs, identical performance in forward or reverse, mounting brackets, & transmission lube oil filters. ZF marine transmission. Oil pumps, control units & clutches are easily serviced or exchanged without removing the transmission from the boat. American Bureau of Shipping (ABS) & Lloyd's Register of Shipping (LRS). The combination of bottom line performance, reliability, ease of maintenance & a host of available, options, backed up by ZF's efficient after sales/service network assures you of the best...ZF! ZF marine transmissions including a free copy of ZF's marine transmission guide. It costs no more to specify the best.